"The ProStrainer is a completely different hair/lint strainer from a flow characteristic and maintenance standpoint. I wish all strainers were this easy to maintain. Just put my first one on a fountain and was shocked at the simplicity of it. I could clean this one in 1/3rd of the time needed for a standard strainer. More expensive but the engineering for water flow is outstanding as well as the space consumption. I wouldn't waste your time if I didn't think this would be beneficial to your designs. Good luck." "Having been in the industry for over 15 years I have seen my fair share of products in the aquatics industry. Many products have come and gone but ProFlo's Prostrainer is one that has come and is here to stay. We look for enduring engineering solutions for our clients and the Prostrainer is a key design component in our pumping solutions. From design through installation the staff at ProFlo provide what it takes to keep us, and our clients, very happy." "ProFlo Inc. has developed one of the industries highest quality stainless steel strainers on the market. ProFlo Inc. has done their homework and engineered a versatile product that has proven itself over and over again in the water feature industry. In commercial applications a durable and efficient product is required and ProFlo meets these standards over and above. Setting a new bar in the water feature industry, we recommend there stainless steel strainer over a conventional strainer any day. Another plus to this product is that ProFlo has the ability to custom fabricate to the customers specifications and parameters, giving the product an advantage over the leading competitors." In my daily course of business as a water feature consultant, I deal with many of the same issues as swimming pool designers. We have to size pumps for the flow requirements of the water effects, size pipes, make recommendations as to the aesthetic impact of hardware and finishes and of course, we size filters for turnover rates appropriate for the size and or shape of the water feature. The one exception (although many pool designers may argue this point) is that water features are notoriously poorly maintained compared to pools. Consider the differences between pools and water features: Swimming pools are designed for people to enter into the water, and fountains are mostly designed for people to look at. The exception in the fountain industry is now the interactive fountain, which invites people to enter into the water, mind you with their clothes on, and bring along with them what ever they have stepped in or can possibly drag along attached to their shoes and clothes or lying on the pavement adjacent to the water feature. Commercial pools have someone checking the water a couple times a day and are typically trained to manage the water chemistry and equipment. Fountains are typically part of commercial properties and are usually dependent on building engineers (read maintenance personnel) to manage the fountain. This of course is only part of their job along with handling all of the building systems down to the light bulbs. This leads us, as good designers, start to think about loading of the sand filter and that in turn usually results in up-sizing the filter to cover for the lack of maintenance. So instead of a 6-8 hour turnover we opt for a 2-4 hour turn over. Since fountains have so little water volume compared to pools, the filter sizes are typically in the 18" to 36" tank size. These of course are mostly driven with standard swimming pool type self priming pumps. And there in lies the problem and the focus of this article. What I am aiming at is the ubiquitous basket strainer. We can up size the filters all we want but the weakest link in any design is also an item that affects everything it is connected to. How many of us have opened a strainer pot to clean out an obnoxious amount of rotting leaves that has all but rendered our up-sized filter useless? In addition, that mass of rot has reduced the velocity in the suction line to the point that skimmers (which I do not use for the same small basket reason) and main drains are basically non functional. With water features which usually have display pumps that are much larger than the filter pumps, this problem can be magnified significantly by the sheer size of the line and the frequency of the maintenance. So what's a designer to do? In my 25 years of involvement in this industry, there were only the following options: Upsize the basket strainer and use a different pump. The down size to this was the basket strainers were for the most part cast iron and brought with them other problems. And of course there was cost. Then came stainless steel strainers in the same configuration as the cast iron ones, this was better. Then came PVC strainers in the same configuration as the as the stainless steel ones, this was cheaper. The problem with the different materials was that they did not improve on the functionality of the product. They just copied the arrangement and solved for some of the other issues (stainless steel solved the rust issue and PVC mitigated the cost issue, somewhat). So when one day into my office came a gentleman showing me some nicely designed stainless steel pool products, our conversations led to my statement, "What the fountain industry really needs is a new basket strainer". I went on to describe the debris issues we faced such as newspapers, plastic shopping bags and the frequent article of clothing. Fountains it seems are the favorite bathing places for the homeless. I also described how we often dealt with much larger suction sizes and we were always fighting for equipment spaces within these buildings and strainers were one of the biggest space hogs. A few months later, back he came with a new product he had named Prostrainer. To say that he had addressed my issues would be an understatement. What he had designed was a totally new approach for a strainer that accomplished a number of things. First, he was able to increase the straining open area to an amazing amount relative to both the pump suction and any other strainer area I have seen. Second, the arrangement of the baskets (yes, more than one) was totally different than the normal vertical position in most strainers, and were laid sideways. The sideways arrangement allowed for a flow path between the baskets directly into the suction port of the pump. What this arrangement accomplished was the ability for the baskets to load heavily with debris and still allow the flow path into the suction port to be undisturbed by turbulence typically observed in vertical baskets. In some tests that were run with the Prostrainer heads up with a conventional swimming pool pump and strainer, a plastic shopping bag was dropped into the suction line. While the conventional pump and strainer arrangement cratered in both flow and head output, the Prostrainer set never skipped a beat. The other innovation this product brings is its low profile. 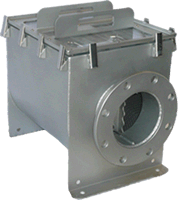 Most strainer pots have a vertical basket which requires a fair amount of space from floor to centerline to install on a pump. This raises the pump off the floor and requires a housekeeping pad ($). The Prostrainer arrangement allows the installer to all but eliminate the pad except for the convenience of keeping it off of the floor. Along with the savings of the housekeeping pad comes something that is mostly overlooked in our industry, namely increased NPSH. 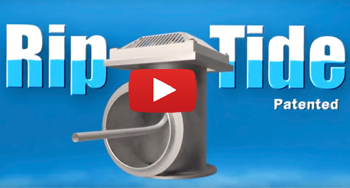 The lower profile of this strainer allows the pump to be lowered, increasing the head on the pump suction. This increased head allows the pump to run more efficiently and put less strain on the seal and bearings. 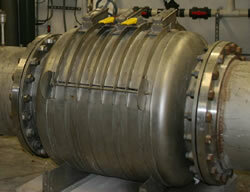 All this translates to longer pump life and lower operating costs over the life of the pump. It may seem insignificant to the designer, but do the math and show it to the owner/operator and the reaction will tell the tale. Some of you may be thinking that I own stock in the company. I do not, I only wish that I did. This is a product worth looking into because it is so much better that what we have had in so many ways. Maintenance is the bane of any fountain because it is so inconsistent. If there is something on the market that I can use that extends time between maintenance cycles or is more forgiving of poor maintenance, then that is not only good for my clients, it is also good for the industry." Dominic Shaw, Waterline Line Studios, Inc.
"The new ProStrainer only needs to be serviced about once a month, compared to one to two weeks with their strainer we had before. So far everyone is very happy with it. Thanks!"